This week we had not one, but TWO central banks printed their policy decisions for the month of August. It’s also pretty chill over inflation, saying that recent reports are “broadly as the Bank expected.” For now, the deflationary effect of discounting due to increased retail competition is being offset by higher tobacco and utilities prices. Lowe and his team didn’t pass up the opportunity to jawbone the currency. Not only does the RBA believe that a strong currency is expected to “contribute to subdued price pressures in the economy,” but it also remarked that “an appreciating exchange rate would…result in a slower pick-up in economic activity and inflation than currently forecast.” Yikes! While we’ve already heard that Governor Philip Lowe preferred a weaker currency, the RBA’s announcement still dragged the Aussie lower across the board. The RBA provided more deets in its quarterly statement on monetary policy released earlier today. In it the central bank downgraded its growth forecasts for 2017 partly due to “temporary factors.” Meanwhile, it core inflation forecasts haven’t changed though the trajectory has shifted higher due to higher commodity prices. Last but the least, the central bank repeated its concerns over a strong currency and hinted that it would factor in the board’s future decisions. Yipes! 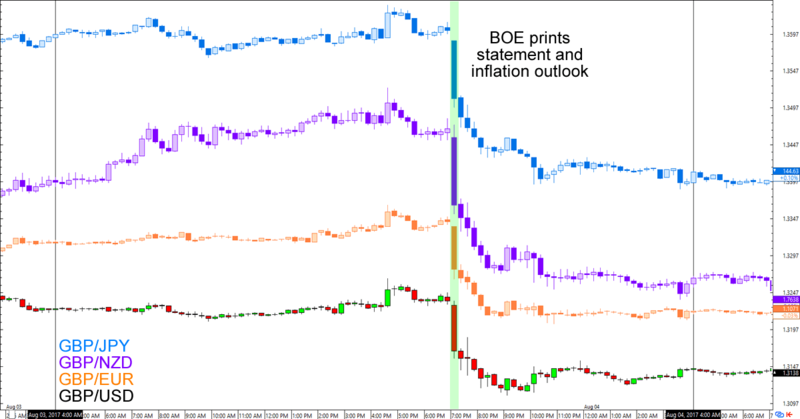 Market players were expecting volatile price action during the BOE’s “Super Thursday” and the central bank sure didn’t disappoint! Much like the RBA, the BOE kept its monetary policies unchanged for another month. Interest rates is till at 0.25% after a 6-2 vote while its QE program is maintained thanks to a unanimous decision. The Monetary Policy Committee (MPC) also voted to confirm the end of the Term Funding Scheme’s drawdown period on February 2018. Remember that the hawk camp lost a supporter after Kristin Forbes voted her last vote last June. Ian McCafferty and Michael Saunders are now the only MPC members voting for a rate hike. As expected, the BOE downgraded its growth forecasts and upgraded its inflation estimates. Mark Carney and his gang cited sluggish growth in the first half of the year a reason for its downgraded growth estimates although it also pointed to the squeeze on the households’ real income – both from a strong currency and Brexit concerns – weighing on consumption. Meanwhile, inflation is expected to remain above the BOE’s 2.0% target (and even reach 3.0% in October) as the post-Brexit Sterling weakness continues to push domestic prices higher. However, the BOE also expects inflation to go back down to its target in 2018 thanks in part to the impact of high fuel prices being taken out of the central bank’s comparisons. One thing we should remember is that the BOE’s estimates currently assume a “smooth” Brexit transition. “…the MPC’s projections are conditioned on the average of a range of possible outcomes for the United Kingdom’s eventual trading relationship with the European Union. However, he also added that “the assumption of a smooth transition to a new economic relationship with the EU will be tested.” In fact, he already shared that investment levels in 2020 are already 20% lower than a BOE forecast before the Brexit vote. Yikes! Remember that the BOE has been shying away from raising its interest rates despite rising consumer prices because it believes that stimulating growth and employment leaves room for inflation overshooting its 2.0% target. “…given the assumptions underlying its projections including the closure of the drawdown period of the TFS, and allowing for the effects of the recent prudential decisions of the Financial Policy Committee and the Prudential Regulation Authority, some tightening of monetary policy would be required to achieve a sustainable return of inflation to the target. Not even hints of a rate hike down the road were enough to ward off the market bears. One possible reason is that market players don’t agree with the BOE’s assumption of a “smooth” Brexit. Other analysts have also noted that a rate hike some time in 2018 or 2019 is just too far down the road to be priced in for now. Whichever the case may be, the pound fell across the board and hit significant lows against the dollar and the pound.